On Sunday May 6 we attended South Side Church and were challenged by this verse in relation to our lives. Many of us found this verse to be applicable to our current journey of crossing borders and building connections. The sermon challenged us to allow ourselves to be vulnerable and open to the pruning necessary for further growth and change in our lives. LET THE PRUNING BEGIN! Our trip began with building connections among our group thanks to 12 hours of travel! We arrived in Tucson around 12:15 pm although our bodies felt like it was 3:00. The remainder of the day consisted of getting acclimated to our new climate of 93 degrees, which required bonding, sleeping, sleeping, sleeping, and more bonding. We visited the Florence detention center and also spoke with a human rights lawyer who works specifically with detained, undocumented immigrants. We were challenged with the two different viewpoints and began our inquiry of what really needed to be changed along the border and also in our justice system. 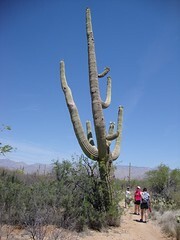 Today the group went to Saguaro National park; in reality the park was a desert, which helped us understand the journey of a migrant somewhat. The group hiked about 2-3 miles, only a fraction of what they would walk after crossing the border. Next, we went to San Xavier Mission, which is a Tohono O’odham Indian reservation just outside of Tucson. The mission consisted of a church, market for food, and small shops filled with handmade jewelry, pottery, moccasins, and the list could go on. We ended the day by dining downtown reflecting on our adventurous day and celebrating Cinco de Mayo. We attended South Side church and felt very welcomed by the congregation. The service was rich with sounds of the south side choir and driven by a thought provoking message. That afternoon we participated in Samaritan training, which specializes in the aid of migrants traveling through the Sonoran desert. This, today, has been the most intense, heart wrenching, and emotional day so far. We began at the border, viewing the wall. We then entered Nogales, Mexico and proceeded to tour a factory specializing in the making of dental implants, crowns, and dentures. Following the tour we had the opportunity to speak with immigrants recently deported as well as those preparing to cross [the border]. This was the most difficult part of the day, due to their stories that hit close to home. Next we were welcomed at the HEPAC community center with a hearty, flavorful lunch. During our time there, we played with the local children, were greeted by numerous four legged friends (cats and dogs) and participated in two lectures. Our final stop of the day, ended at the house of Señora Cruz, where she force fed us (lovingly) the most wonderful meal, and shared her life story in Mexico. 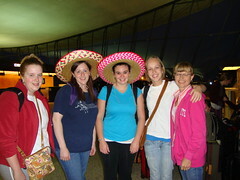 As we reflect over these past couple of days, we continue to grow more excited for our time in Mexico! We ask for prayers of safe travel and learning to cross borders and make connections. Today we headed out of Tucson around 12:00 p.m. and made a pit stop in Tombstone, AZ. The group was treated to a wild west experience including cowboy apparel, souvenirs, shops, jewelery, and saloon style dining. Our one hour stop soon turned into two hours. We then rushed to Douglas, AZ and were oriented to the Migration Resource Center. The group participated in a vigil remembering immigrants whose lives were lost traveling through the desert. We proceeded into Aqua Prieta, Mexico where we will be spending the next week. Breakfast was served at the Community Center at the early hour of 7 a.m. Following breakfast we attended in a bible reflection at Just Coffee. After this we went to C.R.E.E.D.A. which is a rehab center for community locals who have addictions to drugs and alcohol. Individuals from CREEDA led us in a walk through the desert on paths used by immigrants to the border, helping us understand a portion of their journey.